Finally an LED bulb as beautiful as its carbon filament counterpart: the LED Smoky Light Bulb - Globe G125 Curved Spiral Filament revolutionises LED bulb aesthetics. 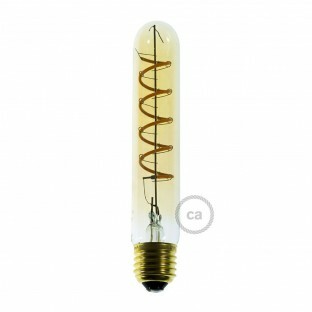 Its curved filament produces a warm and intimate light, comparable to the traditional 40-45W bulbs but with lower consumption and longer duration. The smoky tinted glass gives a vintage feel to the final result. Just like old-fashioned bulbs, you will be able to adjust the luminous intensity to adapt it to different spaces and moments. ATTENTION: to properly dim an LED bulb, a specific dimmer or the latest generation of universal dimmers is required. You will find a specific section on our website with a selection of both wall and in-line models. 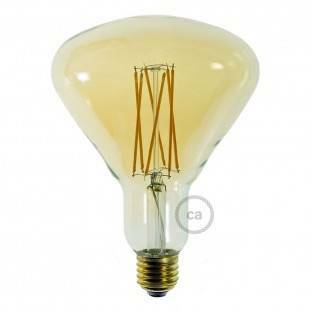 Our bulbs with straight filament can work with all DIMMERS (TRIA or IGBT), while for curved filament bulbs, IGBT dimming is highly recommended. For the choice of the dimmer: in addition to the maximum power of the user, the minimum power must also be considered, because when the regulated power is lower than the minimum rating, the user can "flicker" and / or be damaged.